This type developed directly from type B. The upper hilt is massive. It consists of one piece that is five-sided and with a cross section as in type B. Usually it has a uniform thickness throughout, although sometimes it is slightly tapered at the top or bottom. The broadsides of the upper hilt are most often furnished with two horizontal ridges or protruding edges, one in the dividing area between the upper guard and the pommel, and one between the outer corners. On one specimen in the collection from Sandvigen, this edge is an imitation of a pearled band (sl. fig. 64). Of the two ridges, the uppermost ridge is sometimes omitted. The section between these two edges is most often curving inwards, although the older specimens are without this inward curvature, just like in the previous type. It is less common that these ridges are substituted by inlaid forged stripes or protruding moldings that seem to be imitations of twisted or smooth thread that has been inlaid in these stripes. In one single specimen, B 1622, from Sæbø, Vik, Sogn, there are remnants of a metal thread. Finally there exist individual, especially smaller hilts, where the broadsides are entirely smooth. The lower guard is most often ridged with inward curvature between the ridges. It can however have the same inlaid forged stripes or protruding moldings as the upper guard. Just as with the previous type, this type makes a heavy and massive impression. The hilts, similar to both of the previous types, are completely massive. The pommel or the upper hilt can reach a height of up to 6.4 cm. These swords are among the heaviest of all the swords from the Viking Age. I have thus weighed a sword here that [~66] weighed 1.896 kg. (C 777 Vik, Nes, Hallingdal), making it the heaviest of the swords that I have tested. It is probably only type D that can measure up to our type [C] when it comes to weight. Here in this country, I know the type in 110 specimens. Those swords that have lost their upper hilt, but that nevertheless have a lower hilt belonging to this type or the previous, have not been included among these [110 specimens]. Of this latter group I know 33 specimens, divided among types C and B, but mostly of type C. Of the proper C-type, 67 are single-edged and 40 double-edged. Three were laid down without a blade. It should be noted that damascening never occurs on swords of this type. On the previously mentioned specimen B 1622, there are inscriptions on the blade however, although not with Latin letters but with runes that might very well be Nordic. Of the 33 specimens without an upper hilt, 21 are single-edged and only 12 double-edged. As we see, this corresponds approximately to the relationship seen with respect to the C-type. This type is spread widely all over the country. There are however certain exceptions to take note of with respect to the distribution. There are relatively few swords of this type in Hedemarken County, even though they are otherwise very numerous. The same is true in Akershus County. Jarlsberg and Larvik County do not show any greater numbers either, and this county has the most numerous sword material aside from the counties in Opland. On the other hand, the type is greatly represented in the inner counties of Kristians, Buskerud and Bratsberg, just as there are several on Vestlandet, all the way from Jæderen to Trøndelagen. Of the weapons that appear together with swords of this type we shall first take note of the axe-blades, where no less than 16 specimens are of the D-type. In a couple of instances the shape is closer to those of the B-type and in a couple of others to the E-type. Some specimens that occur are a further development of the A-type in its transition to the H-type.The spearheads are particularly of the E-type, both with and without elliptical figures on the socket. Furthermore, we have type B and in two cases type F. Finally, in one find we have type A; just like we have type L together with type E in another find. The shield bosses are exclusively R 564, with a high offset. Among the rattles there are always the older types. Of the oval buckles there are finally, in two finds, specimens of the type R 647. In one find, B 6178 and 6371 from Ytterdal, Norddalen, there is a double burial, where the male grave was destroyed by fire but where the female grave is intact. In the latter grave there are oval buckles of type R 657. According to Montelius's chronology these should be from the second half of the 9th century. The two funerals cannot completely be viewed as being from the same time period entirely, because for one thing the burial customs differ. The same difference in burial custom and the same disagreement in time period is seen in find B 6660 from Degernes in Ørsten, where the buckle is of type R 654 and therefore even from the 10th century. The determination of a time period for this type should also seem evident. Axe-blades of type D, which is the most usual one together with this sword type, belong to the early Viking Age, [~68] particularly the first half of the 9th century. They are a typological development of type B, which belongs in part to the 7th period. Type E is again a further development thereof. In its earliest form, in which the edge [of the blade] is straight in relation to the shaft opening, the lobes on the shaft open just opposite one another, and the offset is just about at the middle of the blade; this type should belong to the second half of the 9th century, appearing at the middle of the century. The spearhead of type E, which is the most usual together with this sword type, is known here in this country from the early Viking Age (see my discussion regarding the treatment of the type under "spearheads"). I shall, in short, repeat the evidence hereof: this type appears undoubtedly only together with swords of older types like the D and E-type; in one find with a single-edged sword without guards, and in one other find with swords of the B-type. Besides, there are usually axe-blades of the types A, B and D and shield bosses like R 564. The rattles are always older types. All in all we have not a single find that shows that this spearhead type appear together with later items. It belongs most likely to the first half of the 9th century. The spearhead of type B is, as previously shown, very old and appeared at least as early as the 7th period, belonging otherwise to the earliest Viking Age. The F-type extends back to the middle of the 9th century. The shield bosses definitely point to an earlier time period. So do the rattles which seem to belong to those forms that point to the middle of the 9th century. The oval buckles indicate the same. It seems therefore that the sword type C first appeared at the beginning of the Viking Age and was in use until the middle of the [9th] century. This appears evident from the find combinations. In my aforementioned work "En norsk sverdtype fra vikingetiden" I have tried to show that this type, on Vestlandet, in Trøndelagen and partly in the inner rural districts, is a replacement of the single-edged swords without guards. We therefore see the peculiarity that the blades in this type are predominantly single-edged. This is a domestic replacement of a domestically forged type, especially when considering the development that these have had with respect to the length of the blade. I must however add that this is not the only type that has been a replacement. This was also true especially with respect to those older specimens of the H-type, and also with a couple of others less common but simpler types. I still perceive the type as completely domestic. Furthermore, I know seven specimens of the type in Sweden. Of particular interest is nr. 6001 from Uppland, where the upper hilt is of the C-type, but the lower hilt is of the H-type; we shall hear of a similar case from Norway (T 6253 Re, Heldalen) under the discussion of the H-type. I know two specimens from Gotland (Inv.-nr. 14623, 5604: 20), one from Kalmar County (Inv.-nr. 14338), one from Värmland (in Karlstads museum) and [~69] finally, I have seen two swords from unknown locations in Statens historiska museums magazine. 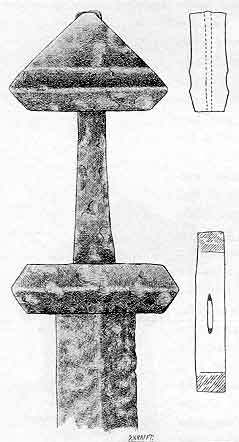 Belonging to the same type are also the bonehilts from Gotland with rune-inscriptions on one of the hilts pictured in Månadsblad 1898-99, p.75 fig. 31-32. I don't know the type in Denmark. However, according to notes that I one time borrowed from Professor Gustafson, there should be two in British Museum and one in Dublin. Finally, one sword of this type has been found on Orkney. The sword has the same type of véttrim [ferrules] and the same type of bronze cover around the tang, created by closely placed animal heads that we later shall hear about under the H-type, and whereof I furthermore know two specimens in this country. I undoubtedly perceive these swords found in the western parts as a Nordic, particularly Norwegian, type. The type makes the same massive and heavy impression that characterizes so many of the swords from the first half of the 9th century. However, we shall now turn to a type that at least in its origin makes a foreign impression. The text of this English translation is Copyright &COPY; 1999 by Kristin Noer. All rights reserved. Country of first publication: United States of America.